Okay, we’ll be the first to admit it’s a silly title. Five years ago no one would have had any idea what we’re talking about. But if you’ve been keeping up with what’s happening on the web, chances are you have heard of the many positive, non-silly things social media can bring to the table. Take for example Twitter: businesses, celebrities, entrepreneurs, Internet marketers, and even celebrities are now leveraging the microblogging platform to enhance their presence online. So should you! One of the many useful features of Twitter is the ability to “retweet” someone else’s tweet (text-based post). If you post tweets that your Twitter followers would find compelling enough, and worthy enough of being shared to their own followers, then they can simply “retweet” your post – and effectively extend the reach of the message you’re trying to get across. Naturally, anyone who wants to succeed and stand out on the web will want to support this easy dissemination by writing retweetable tweets. The only question is: how? Let’s check out the anatomy of a retweetable tweet. By breaking it down, you may just be able to increase the potential of your tweets to go viral. 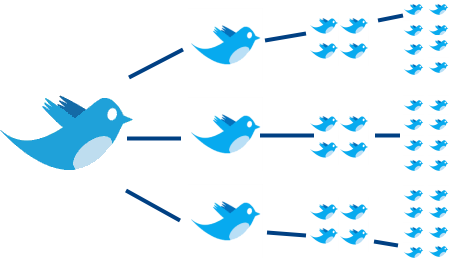 Adding links to your tweets not only allows you to expand on what you’re saying. You’re also leading followers to a page – with a video, an article, a website, a cool promo – for which they might thank you. Think of it this way: someone is lost and when they approach you, you give them the right directions. You’re in a position to be thanked profusely for offering something so valuable. Give them the right directions and – well, you’re in a position to be perceived as disreputable. So add a link to your tweets – a link to anything that your Twitters followers will find worthy of clicking, reading, watching, and sharing – and make yourself more retweetable. Of course, you’ll want to use a URL shortening service like bit.ly in order to have enough room to type out appropriate and catchy descriptions. A retweetable tweet – as we’ve pointed out in an earlier post – leaves enough space for users to do just that. So don’t write out something that’s more than 120 characters – leave the remaining 20 to your followers. Some like to type “RT @yourusername” when sharing your tweets, some like to edit or reword your post, while others still like to add their own commentary to what you just tweeted. Whatever the case may be, make life easier for them. Take a look at the above tweet. If CNN wrote instead, “we thnk rnd paul will win repub senate nomn. in ky”, do you think those 23 people would have retweeted it? Few followers would have understood what CNN’s tweet meant – and even fewer would deem it worthy enough to share to their followers. It’s not just the spelling – it’s also the proper use of proper nouns that make for more retweetable tweets. Do it properly and you’ll look like you’re tweeting an important headline, one that is more likely than unprofessional-looking tweets to go viral. Save for profile pictures and background designs, there’s nothing else on Twitter except for text. You can’t embed videos. You can’t embed photos or audio. What you can do, however, is let your followers find out more about you by crafting a credible – and compelling – bio. You can also insert your URL and link to your official website or blog. How exactly do these make you retweetable? Well, they establish your credibility – and they give your Twitter followers an idea of what kind of content can be expected from you. Meet these expectations on content, and chances are you’re going to get more followers. And you’re going to be a lot more retweetable. They sound spammy, but requests for a retweet actually work. Just don’t do it all the time. If you’ve maintained proper Twitter etiquette, if you’ve been exerting the effort to engage with your followers, and if you’ve been churning out some really interesting stuff, then it won’t hurt to ask followers this small favor. Word it effectively – and simply: “Please retweet/RT”, “New blog post”, and “Check out…” are only some of the effective ways to make your tweet more retweetable. We repeat, however: don’t explicitly ask for an “RT” all the time.